Humpbak whales quizz: right answer! Ifaty (in malagasy : the corpse) is a fishermen village about 22km north of Toliara. 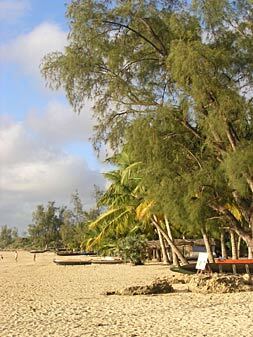 In most guide books, and in the usual glossary of tourist in Madagascar, Ifaty means The Seaside Resort of Toliara. But actually, most hotels and restaurants are located in Mangily (in malagasy : itching), 4km norther. Both villages are on the Ranobe lagoon shore. Atimoo plongée is located in Mangily. Mangily was first just a stop in the Ranobe bay for vezo fishermen on their way north or south, then came the hotels, first of them the Mora-Mora. Mangily grew up and is still growing up so fast that it surpasses now Ifaty, both in population and hotels. Still a small village yet - no sewer, no water but from well, no electricity : one has to make them, or do without - and not typical at all, with many 'hotels-restaurants' ( about 15, from the luxury to the straw-made one, all well melt in the landscape, you can't see them from the sea) and its blended population - vezo, masikoro, tanalana, antandroy, vazahas... - in between lagoon and spiny forest, it is the perfect base camp for a few days around. Have breakfast andalavato or under the big tamarind tree, listening to radio mangily. Coffee, pancakes, bokoboko, mokary and news, fresh from the night. Mangily is still a small village, where gossip is quite an art. Very small hotel, cosy and pleasant, in the very heart of the village, in front of Freddy's. Very friendly place, not expensive at all, quite cool in the evening : great for backpackers, but not only! The number 9 national road that crosses the village get some animation at sunset : one comes there to stroll, eat manioc, sweet potatoes and fried fish, gamble when there is money, drink rhum while listening to some tsapiky, gossip, meet people, dance later in one of the two night-clubs..
Sail the lagoon or the reef on 'pirogues' - boatmen will offer a whole day excursion, with snorkelling in the morning and picnic with crayfish at Ambolimailaka, where you'll watch the fishermen coming back to shore, dizains of 'pirogues' competing in shouts and joy - Ah, tea mitabataba vezo reo !- to be the first and get the best price for the fish. or the tortoise park, fascinating in winter - they're all sleeping ! Historical restaurant in the very heart of the village,ran by an historical Mangily figure. Ca c'est bon, ça, à Mangily! Mangily gives way to controversy, Mangily an'abo, mangily ambany... Itches up and down. Believe me, Mangily deserves a longer stay to go beyond this bad fame poorly updated guidebooks are still giving it. If you have evidences - pictures or texts - about this strange village where you never get bored, please send them to us ! Here would be enough material for a ton of novels, if it wasn't more thrilly and interesting to live them. MANGILY LIVES ! PLEASE COME AND SEE AND LIVE WITH IT!